This resource provides 7 at-bats of describing the meaning of ordered pairs. 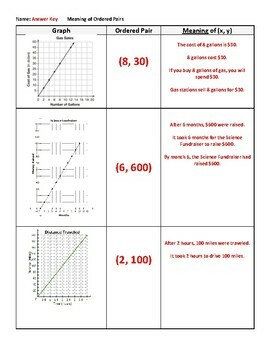 This activity can be used at the beginning or throughout a functions or scatterplot unit. 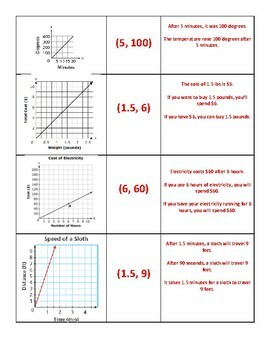 Students are more likely to understand the purpose of a function if they can name specific moments on a graph and what those moments (points) represent. I have used this as notes, as partner practice, and as homework. 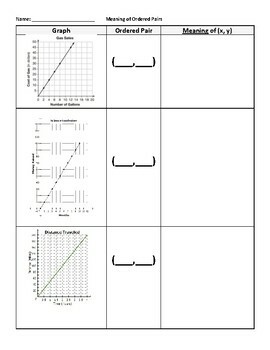 As a 7th grade teacher, I used it before I taught unit rates. It is great for ELLs. When students come up with one "meaning," I often push them to rephrase it differently in order to increase understanding. The responses my students have generated over the years are a part of the answer key.